Cellula's Suction Sampler is designed for taking biological samples using an ROV at depths down to 4500msw. The sampler is compact, light weight and includes eight, two liter sampler bottles. The sampler only requires two proportional hydraulic valves on the ROV to operate. Using hydraulic power from the ROV, a centrifugal water pump pulls water through a sample hose, and a two liter sample cup. The pump is located on the cup outflow. When sampling is complete, a hydraulic Geneva drive rotates the carousel sealing the previous cup and opening the next cup ready for sampling. 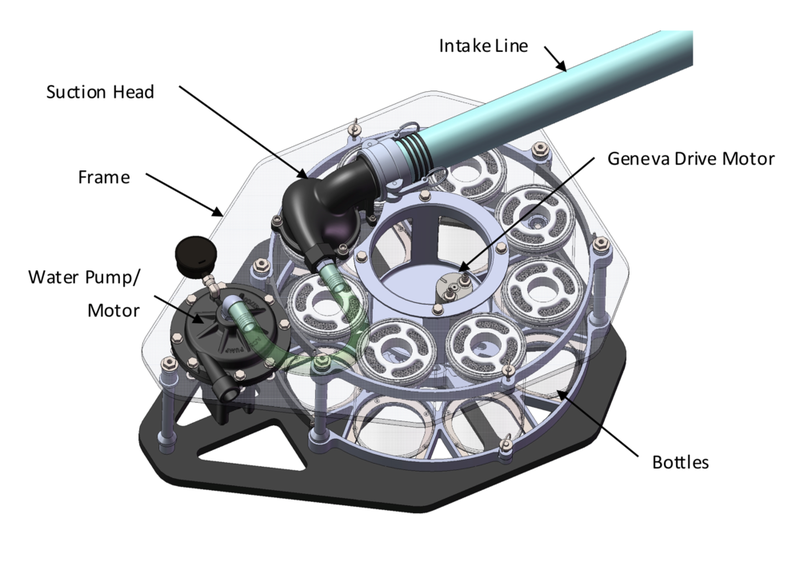 The ROV Suction Sampler pulls water, and biological samples into two liter sample cups. The samples are trapped in the cups with a user selected filter size. Once sampling is finished, the cup is rotated out of the water flow and sealed for subsequent analysis. Requires only two hydraulic valves on a ROV; no electrical interface is needed. The suction sampler is compact and lightweight in air and water. We'll customize the ROV Suction Sampler to fit your organization's needs - request a quote below and we'll be in contact. Have more questions before you purchase? Feel free to message us at [email protected] or through our contact form.